Assistant Professor Sarah Mire won the UH College of Education's 2018 Research Excellence Award. Posted December 28, 2018 – Ask Sarah Mire about autism, and she’ll talk with passion and in paragraphs about the psychological and social challenges the condition brings upon children and families. To that end, Mire said she sees research as the best way to help the most families impacted by autism. She delves into critical topics such as how parents choose and implement treatments for their children and what contributes to parents’ stress. For her work, Mire earned the College of Education’s 2018 Research Excellence Award. Assistant Professor Sarah Mire met in December with students on her autism research team. Mire developed and directs the UH School Psychology Autism Research Collaboration, or UH*sparc, team on campus. Together with her doctoral students, she has found that many parents of children with autism think differently about the diagnosis than professionals do. Her research also has shown that the way parents face the multiple demands – and rewards – of raising a child with autism may explain the high stress levels they often experience. The struggles can mount. Besides finding and affording treatments, parents may have trouble connecting with a support network or manage conflicting recommendations from multiple providers. However, knowing that decreased stress may allow for increased or more effective participation in a child’s treatment, Mire and her team are working to find way ways to help families cope. For example, the team has identified thought patterns of parents who manage autism-related stress well, and believe the practice can be taught to families who are struggling. According to the Centers for Disease Control and Prevention, about 1 in 59 children has been identified with autism spectrum disorder. Children with autism may have difficulty communicating and interacting with other people, affecting their home, school and work life. Treatments vary based on where a child falls on the autism spectrum. Mire emphasized that parents can improve their child’s outcomes and the whole family’s well-being by figuring out the best treatments as early as possible. For the last several years, Mire has partnered with Jennifer Fritz, an associate professor at University of Houston-Clear Lake and director of the Severe Behavior Disorders Research Clinic there. Fritz praised Mire's skill at designing questionnaires to assess parents' stress and analyzing the data for practical implications. "She’s just a fantastic person," Fritz said. "Every time we get together she’s always full of ideas, and we have a great collaborative relationship." Nearly a decade ago, as a doctoral student in the College of Education, Mire worked on a large, national multi-site study through the Simons Foundation Autism Research Initiative at Baylor College of Medicine. Mire said the opportunity to interact with hundreds of families affected by autism helped her realize what she wanted to continue doing for the rest of her career. She worked as an undergraduate at an adolescent residential treatment center and later worked with adults with chronic and severe mental illness. The combined experiences led her to pursue school psychology. Yet she has found that collaboration – across schools, families and community-based health providers – is the best way to help children with autism. “It felt like the only way we were going to make positive changes in individual lives was to make sure the work we do as psychologists and researchers is consistently connected across systems,” she said. Mire graduated from the College of Education with a Ph.D. in school psychology in 2012 and returned as a professor in the Department of Psychological, Health & Learning Sciences a year later. “Being a part of this university and this department is a great honor, and training doctoral students to be researchers and psychologists is truly a dream job,” she said. Mire also served as the department’s inaugural administrative fellow, honing her leadership skills, and in January will assume the role of associate department chair. In addition, she’s working alongside UH psychology department to develop a behavioral health clinic on campus to serve local families, including those who have children with autism. The clinic also will provide a learning opportunity for the College’s school psychology and counseling psychology Ph.D. students. 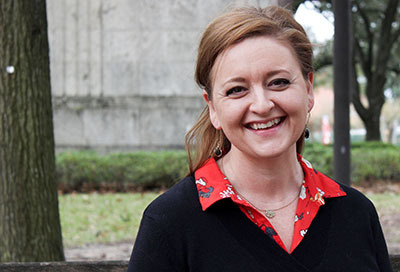 Living in a diverse city like Houston, Mire said, has provided valuable connections, resources and opportunities for her research team. One of their new projects involves trying to engage more culturally or linguistically diverse families in research because of the important practice implications. Dieu Truong, Mire's primary research assistant and a school psychology doctoral student, helped inspire the project on recruiting more diverse families into research. Truong, who immigrated from Vietnam to Houston when she was 15, said Mire has taught her to be methodical and detail-oriented. "I don’t know if there’s a good word to describe how awesome she is. She is very patient," Truong said. "If we have a College mentor award, she should get that." Natalie Raff, one of Mire's former research assistants and a 2016 graduate of the College's school psychology Ph.D. program, echoed praise for Mire's supportive style. She said Mire guided her to pursue research that would be meaningful in practice. "Her creativity and passion are a really important part of what attracts other people to want to collaborate with her," said Raff, now a psychologist at the Center for Autism Spectrum Disorders at Nationwide Children's Hospital in Ohio. "It's really important for her to be able to disseminate information about her findings to make sure everything she does is going to benefit the population she’s researching."